Description: Mark Nolan is the oldest brother of an extremely dysfunctional family. After his sister, Victoria, is killed in a car accident he finds himself the unlikely guardian of his niece, 6 year old Holly. He and his brother do their best to give her as happy a childhood as they can but it isn't until they meet toy store owner Maggie that things really begin to improve. My Impression: To be honest, the only reason I picked up this book is because of its length (211pg). I needed another book to get me to my goal for this month and this one did the trick. Once I started reading it, however, I loved it. 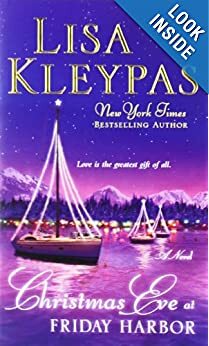 I'm not sure if I've ever read a contemporary Kleypas but I've always been a fan of her historicals. Her ability to make memorable and likable characters carries over nicely. I loved the Nolan family - even troubled Alex. Maggie was one of favorite my Romance leads ever. She's nice, she's quirky without being over the top, she's caring but she's a little damaged from her past. My only complaint is that this is a very short book. It's not quite a novella but it's definitely on the short side. I would've been unhappy if I'd purchased it for full price. Since I got it through paperbackswap.com it doesn't bother me too much. My annoyance at not being able to spend much time with these characters is quickly put aside by the fact that this is book #1 in the series. Would I Read More of this Series/Author? : Yes to both. Very excited about this series and Kleypas is always a go-to author. Would I Recommend this Book? : Yes even to people who don't read romance all that much. 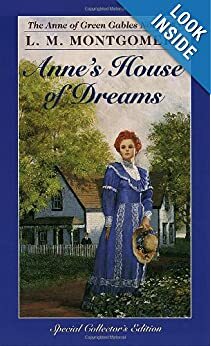 Description: This is the 5th book of the series in between Anne's House of Dreams and Rainbow Valley. It's a mix between the story of Anne as a mother of 6 and the story of Anne's children with their own adventures. My Impression: This is probably my least favorite book of the series. Montgomery wrote it 15 years after the publication of the next 2 books and it has the disjointed feel of something added in afterwards. The book can't seem to make up its mind about if it wants to be about Anne or about her children. I was frustrated by the lack of development of Anne and especially Gilbert as adults. Gilbert is one of the best male characters ever in my opinion and you only get tiny hints of his personality. 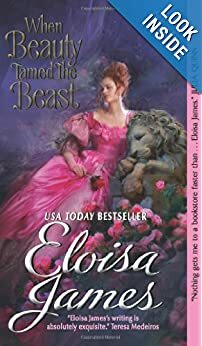 I loved the end scenes between Anne and Gilbert and the beginning with Anne and Diana but as a whole the characters were to shallowly drawn to be satisfying. Would I Recommend this Book? : Probably not unless it was someone reading the entire series and it would be more of a "Might as well" then a true recommendation. Description: The story starts with a pretty clear cut case of an employee stealing money out of an executive's desk. Then the accused employee hires the famed detective Nero Wolfe to investigate the identity of a man her father had saved 40 years ago who was supposed to give him and a bunch of other people money as repayment. When 2 of those people are found murdered things get a bit more serious. My Impression: I know Nero Wolfe is supposed to be one of the best fictional detectives - up there with Sherlock Holmes and Hercule Poirot. I also know that Rex Stout is one of the best classic mystery authors. Despite all that I didn't care for this book at all. To me it read like someone was giving an explanation to what happened "And then she said this, then I walked over and got some coffee, then he told me to get the door". I was definitely never pulled into the story and was never particularly interested in who did the murdering or the identity of the man who owed everyone money. 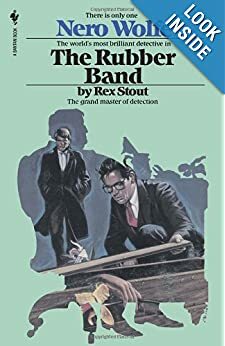 I was very disappointed that I didn't enjoy it since I'm always looking for new authors and Rex Stout would provide me with quite a reading list. However, since I didn't care about the mystery or the characters at all I'll be giving his other books a miss. Would I Recommend this Book? : No. 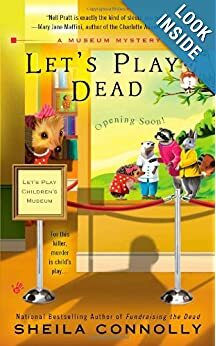 Description: Nell takes some time away from adjusting to being the new president of the Philadelphia Historical Society to visit the new exhibit at Philadelphia's premier children's museum Let's Play. While she's there an employee is electrocuted while setting up the exhibit. He's okay but a few days later another man isn't so lucky. In between trying to run the Historical Society and hiring desperately needed employees she takes some time to help Let's Play Director figure out what happened. My Impression: Sheila Connolly is one of my current favorite mystery authors. Her 2nd series involving the inner workings of the museum world hit close to home for me after years of working at a small museum. Connolly does a good job showing the politics of museum, the constant need to raise money and the time and effort it takes to get an exhibit open. This is the 2nd book of the series and while it was strong I didn't like it quite as much as the 1st one. This is primarily because it's more of a what happened versus the typical murder/whodunnit format. The end felt a little disjointed because of that. Despite that this is a fairly fast paced book with an interesting setting and likable characters. Would I Read More of this Series/Author? : Yes to both. I already have the next book of this series waiting for me and the 1st book of her newest series (set in Ireland!). Would I Recommend this Book? : Yes, especially to mystery readers who prefer the cozy genre. Despite being a book in a series the books can definitely be read out of order. My Impression: When my older kids were younger we used to play these Nancy Drew computer games all together. They were also overly-complicated puzzles that had to be worked through to solve some crazy crime. We always had a lot of fun with them. When I read the first book in this series it really reminded me of those games. There's no murder, even the dead Uncle may or may not be dead. The mysteries are normally history driven and involve some historical research. All and all a lot of fun with a serious touch of crazy. I enjoyed the second book less than the first and the 3rd even less. The previous books have a huge cast list and they were all back in this book with almost no refresher course in who they were. I spent most of the book completely confused. Would I Read More of this Series/Author? : Actually yes. I've read 3 so far and I really want to see how this all works out. Would I Recommend this Book? : Definitely not this one and would be hesitant on recommending the series. Description: Dr. Josh Scott is overworked and exhausted. He's a single dad, caretaker to his paraplegic sister and runs a hugely busy practice with ER shifts thrown in. Oh and there's also an incredibly destructive pug puppy that his sister got his son. In desperate need of a dog walker he accidentally calls Grace Brooks and she takes the job. Grace is quickly running out of money and picking up odd jobs where she can get them. She has put enormous pressure on herself to be as successful as her family expects her to be. The dog walking quickly turns chaotic and she ends up adding replacement nanny to her resume on top of that. All is going well but will Josh and Grace be able to get past their problems and grab a chance to be happy? My Impression: I had this book sitting on my nightstand for weeks but never picked it up. The description just really didn't grab me though I had liked Josh and Grace in previous books. When I finally picked it up I finished it in a day. Grace drives this book. She's nice, she listens, she cares and she's got a sense of humor. Her relationship with Anna and Toby are really wonderful and really flesh out the story. She mentions her expectations and self-esteem issues about being adopted but I was disappointed with how little that was explored. It's mentioned but it's pretty crucial to Grace being Grace. Josh is also a good character. He can come off as cold and controlling but in reality he is trying to shoulder an enormous weight of responsibilities. I found it believable that he would have a hard time allowing someone to take care of him for a change. Anna's character is nicely developed as well and she does quite a bit of maturing from the beginning to end of the story. Would I Read More of this Series/Author? : Yes. I've read all but #2 of the Lucky Harbor series but I definitely plan on reading that one at some point. I'm already on the wait list for the next Lucky Harbor novel as well. Would I Recommend this Book? : Yes but only to a romance reader. This is definitely not a series that really needs to be read in order and this might be one I'd recommend to start with. 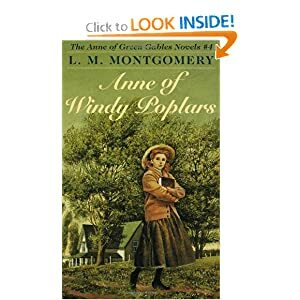 Description: After a long wait Anne and Gilbert are married and off to begin their life together at Four Winds where Gilbert will be working as a doctor. They are far from home but manage to make friends with those around them including Miss Cornelia, Captain Jim and the beautiful complicated Leslie Moore. Mixed in with the the newlyweds' happiness is a touch of tragedy. My Impression: This book starts shortly before Anne and Gilbert's wedding. The buildup and the event was well worth the 4 book wait. While I missed the characters from Green Gables Marilla makes a few visits to Four Winds and their new friends filled a lot of the space left by the other friends. 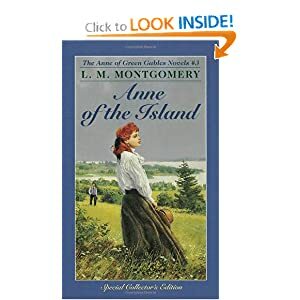 This is the first book in the series that really brought me to tears at one point and Montgomery certainly mixes in some darker elements with Leslie Moore's story. I think the darkness kept the book from being too sweet as it could have easily become. Would I Recommend this Book? : Yes, especially to those who are already familiar with Anne. This would be a good read for someone who had only seen the movies because it kind of starts where the movie ends and it has a new cast of characters. This is my 8th book for the month. I have 7 more to go including 2 more Montgomery books and 1 library book. 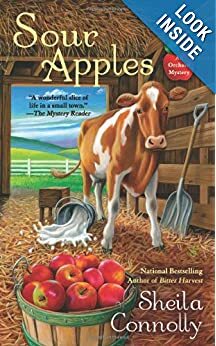 Description: When a dairy farmer is killed in a farm accident that starts looking like murder Meg starts investigating the farmer's claim that something on her land was poisoning the cows. Then Meg's old friend Lauren shows up trying to gain the town's support for a local boy who is running for Congress. Between planting an orchard expansion, trying to figure out what was wrong with the dairy farmer's land and trying to figure out why her boyfriend Seth is so reluctant to back Lauren's candidate Meg has her hands full. My Impression: I love this series but the was definitely not my favorite of the series. Part of the problem was that I enjoyed the previous book, Bitter Harvest, so much that I expected this one to be of similar quality and it wasn't. The apple part was interesting as was the historical research. I was also very glad that Seth and Meg's relationship was explored a little more The start and stop dynamic makes a little more sense. I did not care for Lauren at all. I didn't like her when she had appeared in a previous book and she wasn't any better the second go round. Meg does explain that they were primarily work friends but it still doesn't make much sense why Meg keeps trying to reach out to her. Also, the ending felt very rushed and wasn't properly explained. I got who did it but the why didn't make a huge amount of sense. Would I Read More of this Series/Author? : Yes definitely. I have #2 and 3 of her museum series in my TBR pile and am looking forward to #7 of the Orchard series. Would I Recommend this Book? : Not to someone who hasn't read the series. While the mystery is pretty stand alone it would be difficult to understand who the characters are and how they relate to one another without reading the previous books in the series. Description: After graduating from Redmond College Anne takes a position as principal of Summerside High School while waiting for Gilbert to finish medical school. Friends are made, adventures are had and challenges are overcome. It's told in a combination of narrative and letters to Gilbert. Would I Read More of this Series/Author? : Yes, this is my 2nd one this month and I'm about 50 pages into my 3rd one for the month. Would I Recommend this Book? : Yes, even to those who don't particularly care for Anne. 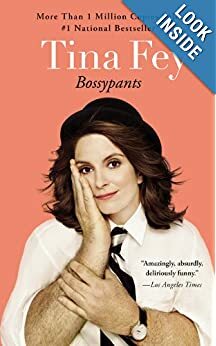 Description: Bossypants is basically a general biography of Fey and her career. My Impression: Unlike what feels like most of the world I don't have a huge crush on Tina Fey. I thought she was the only person on Saturday Night Live who made it worth watching when she and Jimmy Fallon did Weekend Update together. I've enjoyed what I've seen of 30 Rock though it's not on my must watch list of shows at the moment. So all in all I have pleasant but mostly neutral feelings about her not an overwhelming desire for her to be my BFF. Bossypants had gotten so raved about that I finally decided to read it and for the most part I enjoyed it. There is nothing particularly in depth or personal about the majority of the stories. I definitely didn't feel like I had a greater insight to who Fey is after reading it other than fame seems to have snuck up on her. In insight into how comedy works both in improv situations and on SNL was interesting. I laughed a few times and smiled a bit more but it definitely wasn't the funniest book I've ever read. It actually reminded me a bit of Mindy Kaling's book Is Everyone Hanging Out Without Me? but I enjoyed Kaling's writing style a bit more. Would I Read More of this Series/Author? : Probably not. 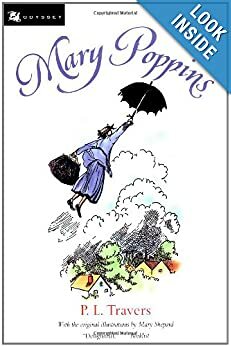 Description: Mary Poppins is the story of a magical unusual nanny who blows in with the wind the take care of the Banks children. My Impression: I've been reading a lot of children's classics lately thanks in part to the library and what is free on my Kindle. Most of them I've loved. When I saw Mary Poppins at the library I was thrilled. I've watched the movie a few times but it's been awhile though I remember liking it. 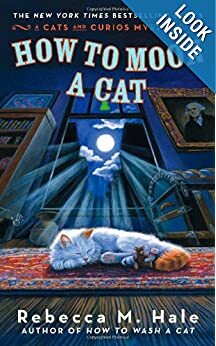 I expected magical nonsense and got lots of nonsense and while there was a magic in the book it didn't translate to a magical reading experience. Mary was vain, prickly and frankly just not very nice. The stories were disjointed and the book itself read more like a collection of short stories than an actual book. 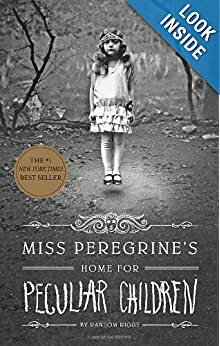 This is one of the few books that I've enjoyed the movie more. Would I Recommend this Book? 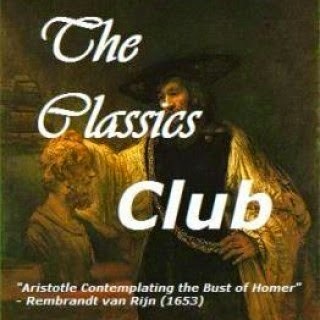 : No, there are so many other classics to read that were so much more entertaining. Description: Linnet is beautiful, well off and altogether ruined. Her family comes up with a scheme to marry her off to the Earl of Marchant who is supposed to be desperate for a wife. Rumors of his desperation for a wife were greatly exaggerated, rumors of his temper and foul disposition were not. My Impression: I've read 2 short stories and a novella by this author. The short stories I didn't like the novella I did so I wasn't sure what to expect with the full length novel. The characters were interesting and entertaining. It was nice at the hero had a job that was clearly shown in the book. They both had parent issues that they needed to work through. I also like that Linnet wasn't perfect - she was beautiful and she knew it, her tongue and her temper weren't always ladylike and she was very good at making fun of people. With all that there was something about the last 50/60 pages that kind of turned me off from the book. On page 200 I would've have gladly read another by the end I wasn't so sure. Would I read more of this series/author? : Possibly though I probably won't go out of my way to search her out. If I see one at the library or on kindle loan I'd probably get it. Would I recommend this book? : Only if it was a regular romance reader. 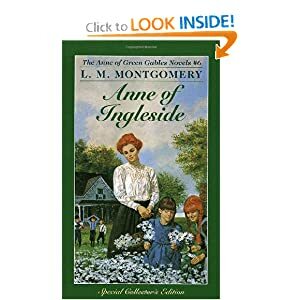 My Impression: This is my favorite of the Anne books so far. The scenes at Patty's Place are fun and the part where she goes to her parents' home is very touching. Also, this book has one of the best endings of all books ever. Would I read more of this series/author? : Yes, definitely. I'm trying to read all of Montgomery's books this year so I've got 4 more to read this month. Would I recommend this book? : Yes though probably not starting with this one. I think you'd need to read the earlier books to really understand the characters and their relationships. Description: Jacob's grandfather spent most of Jacob's childhood telling him stories of his magical and sometimes scary childhood and showing him bizarre photographs. As Jacob gets older he believes less and less of the stories and the bond weakens a bit until something horrible happens. It then falls to Jacob to untangle all the stories that his grandfather told him and separate the truth from the stories. Genre: More of a mystery than anything else but more of a what is going on? than a who? My Impression: Fun read but not a showstopper. This book was definitely not what I expected and definitely outside of my usual reading patterns. Based on the creepy pictures I was expecting a horror/ghost story and got instead a fantasy/adventure story. I definitely enjoyed it and found Jacob relate-able as a troubled teenager not sure who to trust and what to believe. Would I read more of this series/author? : Yes, definitely. In fact I was thrilled to see that there is a sequel set to be published next year. There is also another book by the author that is just a collection of old photographs that I'd love to get my hands on. Would I recommend this book? : If someone was asking if they should read it I would but it's probably not one I would go out of my way to recommend. I'm behind in both but not far enough behind that there's no hope for catching up. So for the month of August my TBR pile consists of 15 books - 5 of those being Montgomery books. So that leaves 6 empty slots to fill. I want to get the library books taken care of first and then I'm going to go through my TBR bookcase. The plan is to update this list with reviews as well as fill in the blanks for the remaining 6.